Amazon.com description: Product Description: After more than a decade of reform efforts in Africa, much of the optimism over the continent's prospects has been replaced by widespread "Afropessimism." But to what extent is either view well founded? 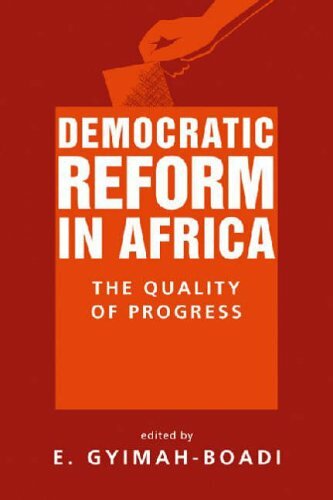 Democratic Reform in Africa plumbs the key issues in the contemporary African experience - including intrastate conflict, corruption, and the development of civil society - highlighting the challenges and evaluating the progress of political and economic change. Case studies of Botswana, Mozambique, Nigeria, and South Africa complement the thematic chapters, exploring the interactions between democracy and development. About: After more than a decade of reform efforts in Africa, much of the optimism over the continent's prospects has been replaced by widespread "Afropessimism. About: Suggesting that optimistic cries of an "African Renaissance" in the latter half of the 1990s may have been a bit overstated, Gyimah-Boadi (political science, U.